A long, long time ago, when giant dingoes roamed Australia (there were dinosaurs too, but they’re not in this story) a big mob of red kangaroos was eating the grass on the Kimberley plateau one fine summer’s morning. They were spied by a giant dingo – bigger than a person, and much bigger than a kangaroo. He crept towards the the kangaroos as quietly as a giant dingo can, which isn’t very quiet at all. When he got close, the kangaroos saw him. They jumped, as fast as they could, to the deep, wide Fitzroy River. The river was in flood, and moving fast. They jumped across it in one great leap, and looked back to the other side. Surely this dingo couldn’t cross the deep, wide Fitzroy River. But this was a giant dingo. He snarled. He ran at the deep, wide Fitzroy River, dived in and with mighty strokes he crossed to the other side. He shook himself off, and gave chase again. They jumped off, heading for the deep, wide, Witenoom Gorge. Surely the dingo couldn’t make it across that too. When they got there, the kangaroos took a giant leap and made it across to the other side. Behind them, the dingo snarled. But he didn’t give up. He ran at the deep, wide Wittenoom Gorge, and in one great leap he made it across – just – scrambling to the edge with his sharp claws. He kept chasing. For days the dingo chased the kangaroos. They crossed all the big rivers – the de Grey, the Fortescue – and the Great Sandy Desert. They were so far from home they didn’t know where they were, but the dingo kept chasing. Soon, they came to the mighty Swan River. The kangaroos had never seen a river so wide. It was as wide as a lake. They found the narrowest part – the same place where the Narrows Bridge now crosses the river – and they jumped. This time, they didn’t make it all the way to the other side. They landed in the shallows, close to the edge. They spluttered, coughed, shook themselves off and looked back for the dingo. But before they had time to notice him, something strange happened. The kangaroos began to shrink. They had never been in a salty river before, and as the sun dried the salt on their skins, they shrank to half their size. Confused and terrified, some of the kangaroos jumped away from the mob and were lost. Nobody knows what happened to them, but when last they were seen, they looked a lot like the wallabies that now live in the south west of Western Australia. The rest, in their panic, jumped all the way to Garden Island, landing in the shallows on the beach. The ocean was saltier than any water they had known! They shook themselves off, and as the sun dried the salt on their skins they shrank by half again. Bewildered, they jumped to Carnac Island, and then straight away to Rottnest Island, where they landed in the shallows again. They shook thesmelves off and shrank again – to the size of a quokka. You want to know what happened to the giant dingo? He too swam the Swan river, and as the sun dried the salt on his skin, he too shrank by half. The same thing happened when he swam to Garden Island and then to Carnac. By then, he’d shrunk so much he was the same size that dingoes are today. Famished, he was ready to swim to Rottnest when he had a thought. What if only he had shrunk, and the kangaroos were still giants? If he shrank again on the swim to Rottnest, he’d be so small that the kangaroos would laugh at him, jump on him and kick him back into the water – and then surely he’d shrink again! So he stayed on Carnac. And even today on moonlit nights on the beach at Rottnest, you can see quokkas lined up keeping watch on Carnac. You might even hear the dingo howl. If that dingo is ever hungry enough or mad enough to swim to Rottnest, how can the quokkas escape? They’ll have to get on the ferry very quickly, and take refuge in the hustle and bustle of Fremantle. 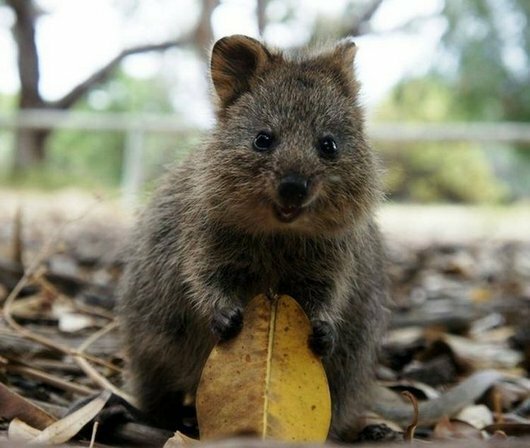 So if you ever see a quokka near the bakery at Rottnest, remember this. He’s not really interested in your cream bun. All he wants is your ferry ticket. © Glenn B Swift. Edited by Megan Anderson.